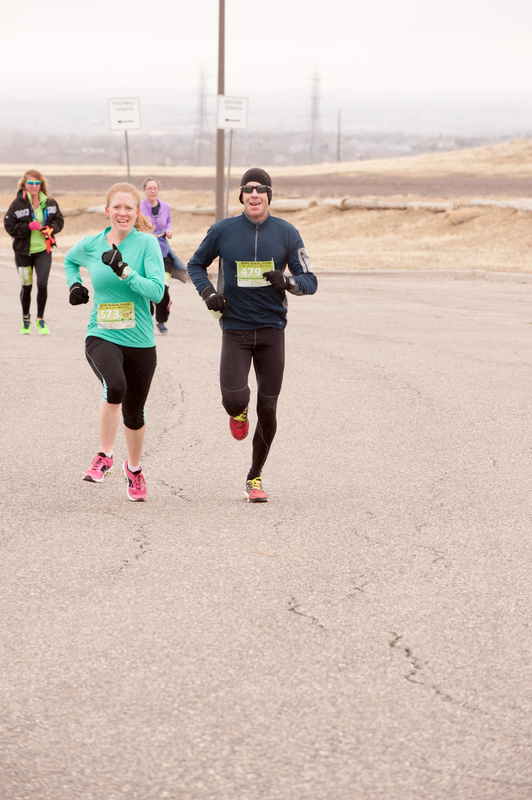 The trouble with spring races in Colorado is that the weather is so stinking unpredictable. 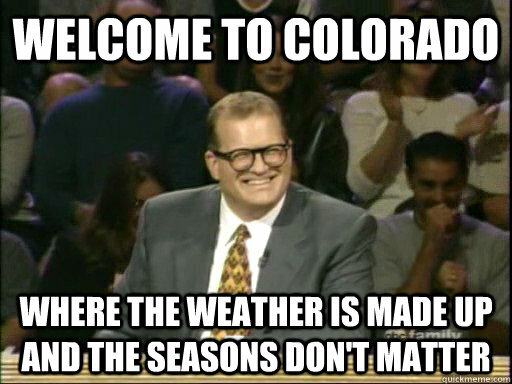 It can be 70 degrees and sunny one day and 20 degrees and snowing the next. 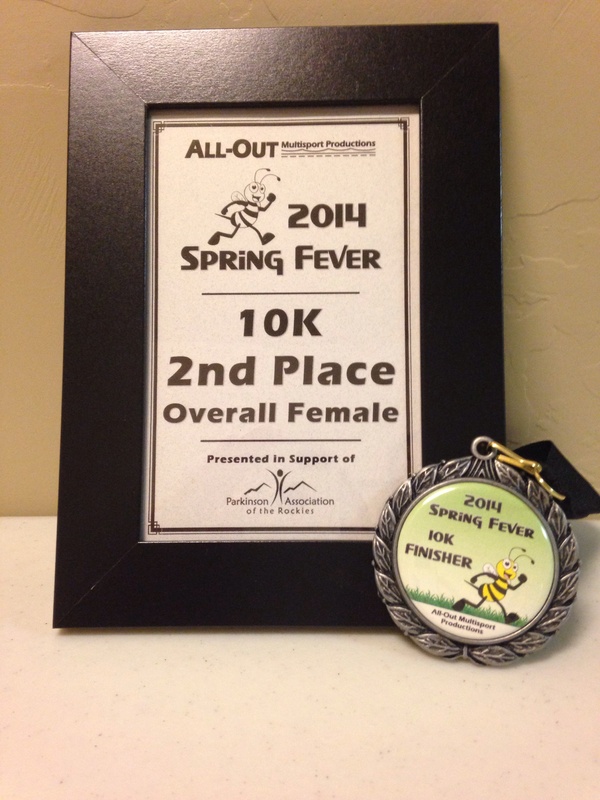 That was the case last weekend for All-Out Multisport’s Spring Fever 5k, 10k, and half-marathon. Friday was sunny and in the high 40s. Sunday was sunny and in the mid-60s. Saturday, though, was snowy, windy, and in the high 20s/low 30s. Saturday was, of course, race day. Usually when I race, I make an A, B, and C goal. For this race, though, I had three equally satisfying A goals, a B goal, and no C goals. My A goals were to PR, set a course record, and/or win the race. After studying the elevation chart, I knew the PR was unlikely (my current PR is 40:30, and that was run on an all-downhill course), but the course record (42:57) was in reach. Looking at past winning times, I thought winning was also in reach, but that would clearly depend on who else entered this year. Since all those goals were dependent on outside factors, my B goal was simply to give all I had to the race. If I crossed the finish line completely spent, knowing I couldn’t have pushed harder, I’d be satisfied. Since we had a work event in Denver on Friday night, J and I decided to get a hotel room and skip the extra driving. The race started at 9:30 and we were only about 30 minutes away, so we had plenty of time to eat some oatmeal, change outfits several times (that one was just me), and plan out the rest of our day. We arrived at the race around 8:45. I checked in, grabbed my bib, and hustled back to sit in the toasty car for a while (and change …again… into a warmer top). At about 9:05, I reluctantly got out of the car, did a mile warm-up with some quick strides, hit the bathrooms (heated, not porta-johns! ), and lined up at the start. After what seemed like 8,000 announcements (not really that many. I was just cold), we were off! During these first two miles, I made a friend named Matt. As we turned into the wind, we took turns drafting for each other and exchanging concerns about when the uphill would begin. Yay! Downhill! (That’s my new friend in the orange, and the winning woman leaving me in her dust.) Photo courtesy of runningguru.com. This is where my new friend Matt pulled ahead. There was another runner ahead of us, and Matt said, “Let’s catch him!” I told him to go on; I needed to keep something in reserves for the final uphill near the finish. Mile 6.01: Ouch. More uphill. Almost there. Push! Push! MIle 6.2: Oh no, tights man. You will not come from behind now! (I beat him. Just barely.) Split: I don’t know because I didn’t stop my watch until over a minute later. MIle 6.21: Gasp. Gag. Don’tbarfdon’tbarfdon’tbarf. Walk it out. I neither PRd nor won. I was three seconds away from the old course record, but that didn’t matter, since the top woman ran sub-40. But I definitely made my “B” goal — I gave it all I had and pushed through on a tough course and a tougher day. So I’m pretty darn satisfied with that. 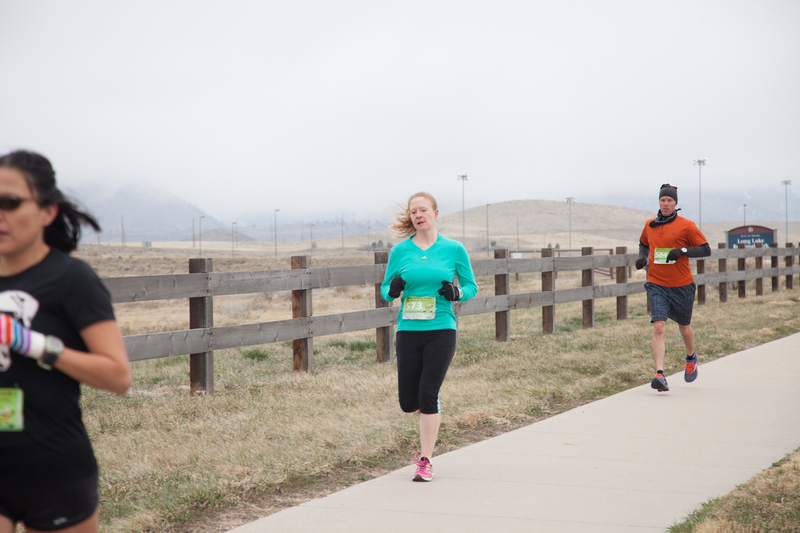 Overall, I liked this race (aside from the weather, but when you sign up for a March race in Colorado, you know what you’re potentially getting into). But it had some negatives, too. Here’s a quick rundown. Well-organized. The half started about 10 minutes before the 10k, which started about 10 minutes before the 5k, and all the starts went smoothly. Bib pick-up was also very speedy and easy. Indoor restrooms. This was a MAJOR plus on such a frigid day. Gorgeous course. It’s in Golden, which is a beautiful area, and it circles a lake. If the weather was clear, it would have been absolutely stunning. Tons of prizes. In addition to overall and age-group awards (I got a restaurant gift card for the second-place prize), the race had a ton of raffle giveaways — restaurant, massage, and running store gift cards, water bottles, gym memberships. I think they said they had over $7,000 in prizes. A podium. What? Not a big deal? Whatever. I thought it was fun. Not all of us get to stand on podiums regularly. 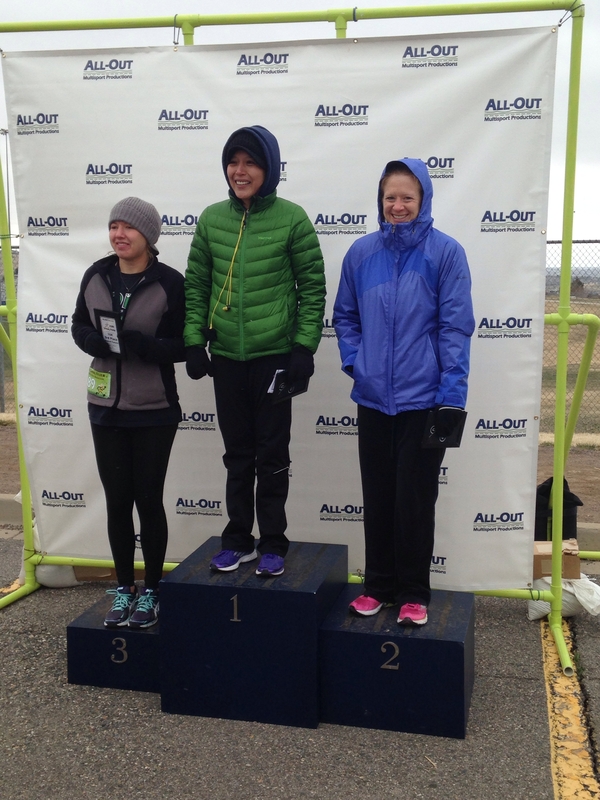 The top three popsicles… I mean women runners. Lots of aid stations and great volunteers. Seriously, how cool do you have to be to stand out in the freezing cold for a couple of hours, handing out water and shouting encouragement? 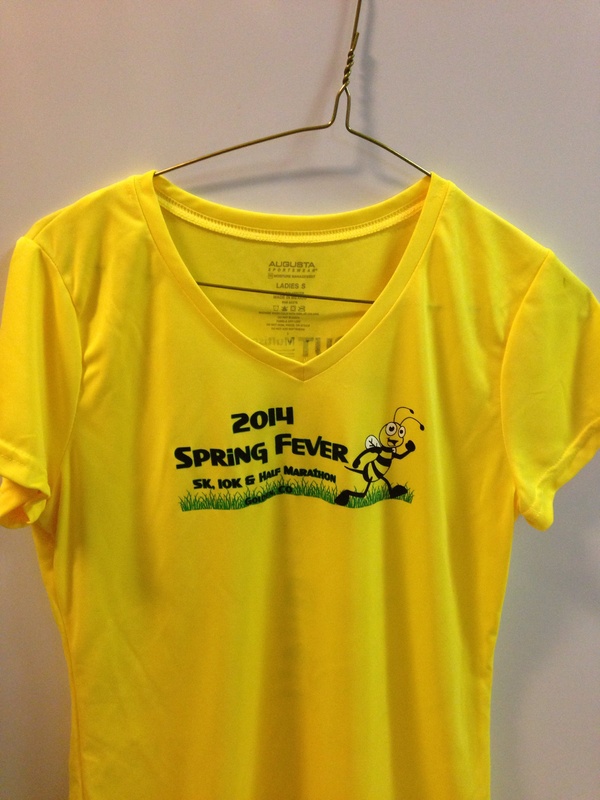 Cute shirts and medals. Honestly, I think finisher medals for short races are a little silly, but who wouldn’t love this bee? A great cause. 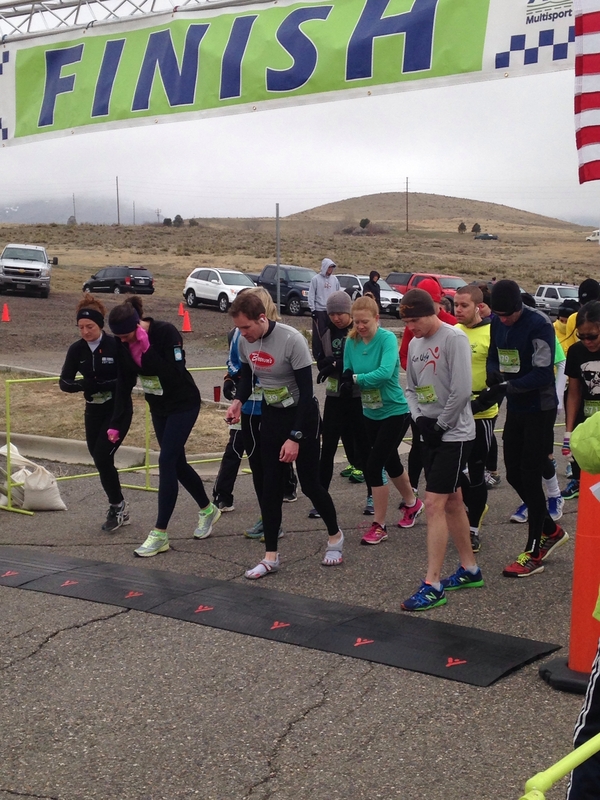 The race raises money for the Parkinson’s Association. Can’t fault that. Free photo downloads. Many races charge obscene prices for the pictures, so getting these for free was pretty cool. Especially since I don’t want to pay for pictures in which I look like I’m simultaneously pooping and dying. Having the 10k and the 5k course share the final 1.5 miles was not fun. It meant that the fast 10k runners came up behind the slow 5kers — people who were just there to walk it with their pals or kids, pushing strollers, etc., or as we got closer to the finish line, run-walkers who would abruptly stop and walk. Not that there’s a thing wrong with those types of racers (J and I just walked one last weekend); it’s just a pain to bob and weave, especially when your energy is running out. A ton of people also had in headphones, so they couldn’t hear runners coming up behind them, gasping out “scuse me” or “onerleft” (that’s about all the enunciating I could do just then). No hot drinks at the finish. All I wanted was something warm. Of course, if they did have coffee or hot chocolate, it would’ve been an 80-degree day and no one would have wanted it, so I can’t really fault the organizers for that one. Overall, I enjoyed this race and recommend it. I’d do it or another All-Out Multisport event again … hopefully on a little nicer day. Once again, I want to give a shout-out to Heather for designing my training plan. The hard, fast workouts definitely gave me the confidence to push through some of the tough spots in the race. Tell me about a recent race of yours! What are your tips for racing on tough days/courses? Previous Post10k Training Weekly Recap: Race Week!Next PostSo, What’s Next? I seriously laughed out loud at your awesome running face! Great work on this race, for real. Tough conditions and you nailed it. Congratulations! Thanks! I have the worst race face. Congratulations again on such an awesome race! And the fact that you came in second and got to stand on a podium is so awesome! You ran an awesome race! It looked chilly. 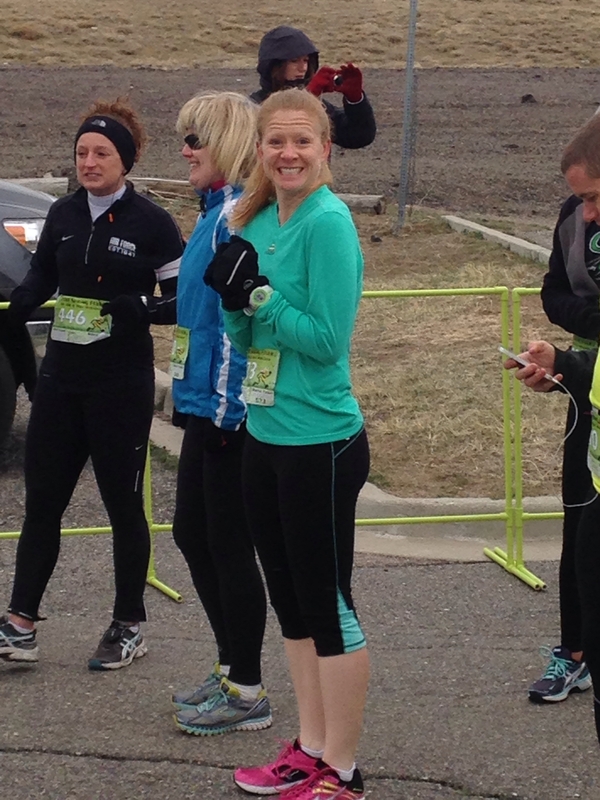 I really enjoyed reading your thoughts on the run…lol. I think our minds go a little crazy during a race. There was no podium at the marathon I won, either. We need to talk to these marathon organizers. P.S. Do you have a post about the marathon you won? I’d love to read it! Look at you on the podium! That is so fun! Congrats! Yeah, I think the only solution is separate courses, but that’s not always feasible, either. Wonderful job on your second place Cassie! I love your running photos, you look so happy, I wish mine were as smiley 🙂 I think you approached it just right, and ran well! Sounds like it was a great race overall! I don’t know if that’s a smile or grimace, haha. Good luck next week! I am so behind on blogs – but YAY!!!!! Congrats!!! I loved your goals and you rocked it girlfriend!!!!!!!!!!!!!!!!! You are such an inspiration! I can’t even imagine running 6 miles in 43 MINUTES! Holy guacamole!!!! Congrats on a 2nd place finish! A restaurant gift card is a great prize. To me, prizes I could use are the best. I loved the details on what you were thinking during the race! Thanks! I love usable prizes, too!